Now it has been seen all over my dog body. My vet has coming to my house and given my dog shots recently but it is not any better. Is it related to his age (9 years) and his immune system? I'm sorry to hear that Bim is having these problems. Usually when we see red spots with crusty flakes around them this means that there is a bacterial infection. Keep in mind, of course, that it is hard for me to make that call without actually examining your dog though. Has Bim been on a long course of oral antibiotics? Usually if there is a skin infection, I will have a dog on antibiotic pills for a period of 3-8 weeks. If this has been going on for a long time, then 8 weeks may be necessary. Ketoconazole is an anti-fungal which works differently than an antibiotic. If this is a bacterial infection then ketoconazole won't work. I had to look up pseudopherine. Was this prescribed by your vet? It doesn't sound like something that would be used for a skin infection. From what you have described, this doesn't sound like an issue with his immune system. Now, if Bim has already been on a long course of antibiotics then I would be looking at more rare possibilities such as ringworm (a type of fungal infection - but this should be improving with ketoconazole). There are other rare conditions such as a skin cancer called epitheliotrophic lymphoma, but this is really, really uncommon. If you'd like to send a photo, you can do so by emailing it to photos@askavetquestion.com. I am just afraid that using antibiotics for a long course would make him really weak since he is 8 years old. And this has been occurred many times. After a week or 10 days, the vet then stopped giving him treatment. then 1 week or 10 days, my dog developed those symptoms again. 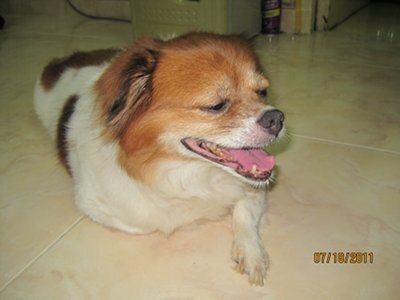 There is no problem with his appetite, he is still fine except itchiness caused by those red spots and flakes. Should I give him a bath with tea tree oil soap? or his regular shampoo? I am really concerned since it's been a month and I am just scared. I already sent some photos. hope you look at them and give me response. From this photo this really does look like it could be a bacterial infection. 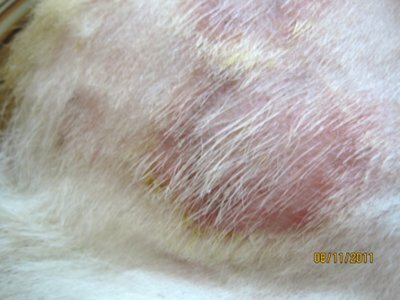 If a dog was treated for 10 days with antibiotics and then stopped, this would not be enough to treat a skin infection. It would definitely come back again. I have absolutely no problem with a dog, no matter what age, being on antibiotics for a long period of time like 4-8 weeks. My guess is that a long course of antibiotics would cure this for good. Now, if it is ketoconazole that he has been on periodically, this drug can sometimes be hard on the liver. But, an antibiotic is perfectly safe. Bathing is not likely to make a difference here. Then I think it is okay to wash him once a week to keep him clean. Sometimes there is unpleasant smell from those spots on his body. I just gave him ketoconazole just yesterday and those spots are redder, so I stopped immediately. He is totally fine except this skin problem. Will this cause him fatal problem if not treated? My vet said that because he is old, so his liver and kidney are weaker than usual, thus this bacterial infection is likely to happen again without using antibiotics. I thought he said that because he would make more money to keep my dog on long course treatment. Is there any advice you would give in his diet? he is a little over-weighed so I just do not know if changing his diet would make any different and make him betteR? Something is not adding up here in my mind. For a dog of this size, 9 is really not terribly old. And, even if he was very old and sick I would have no problem at all with giving him antibiotics. I will commonly prescribe long term antibiotics for elderly animals. They are not hard on the liver or kidneys at all. I can't say for sure without seeing Bim, but there is a good chance that antibiotics would cure this. If it's not treated, it's unlikely to be directly fatal. However, it can spread and get harder and harder to treat and cause him much more itchiness. Ketoconazole is not something that you can give sporadically....and if this is not a fungal infection then ketoconazole is not going to help at all. While a bath won't hurt...it's not going to cure this problem.